You’re in the industry of helping people – but applying some sales tactics to your inbound calls will help your patients and potential patients get over internal hurdles. Out of all the people that visit a hearing healthcare provider and who have a treatable hearing loss, only about 30% already wear hearing aids. Many healthcare providers face pricing objections on top of patients who are reluctant to admit hearing loss. The front office staff in your hearing office most likely does not see their job as a sales position; the truth is that they do need some sales-type mentalities—as author, motivational speaker and all-around sales-whiz Zig Ziglar has taught us, selling is nothing more than finding out what someone wants and then showing them how to get it. 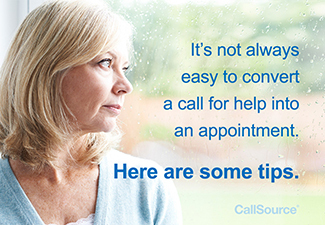 If someone calls an audiologist’s office, they need help. Your office has the solution. You would think in this case that 1+1=2, but it is not always easy to convert a call for help into an appointment. It is then even more difficult to convince a patient to purchase hearing aids that will benefit them. The question is then, how do you help your patients and potential patients get the help that they need? You, the audiologist and the front office staff need to overcome patients’ reluctance and objections. When potential patients believe front office staff and call handlers are trustworthy, they will engage with them like asking a friend for advice when making an important decision. The hearing space is full of hesitant patients. Hearing loss is often a taboo subject. Studies shows it takes an average of seven years for someone suffering from hearing loss to take action. So, if a call is mishandled and an appointment isn’t set for the potential patient to come to the office, it may be another six years before they seek help again. After finding out what the caller wants/needs (most likely help for their hearing), and you can show them how to get it (making an appointment with your office), your front office staff are becoming “assistant buyers” instead of hearing aid salespeople. When potential patients believe front office staff and call handlers are trustworthy, they will engage with them like asking a friend for advice when making an important decision. Providing information to the caller that they did not directly ask for is not using pressure. In fact, if the patient did not want information, they would not have called in the first place. As the call handler of your audiology office, you are the first impression and also now the expert. By answering the caller’s questions and overcoming objections, you are merely solving for why they called or came to see you. CallSource has been analyzing phone calls for over twenty-five years. We have heard just about everything. Below are two separate responses that phone handlers have given a patient who is reluctant to set an appointment due cost of hearing aids and insurance coverage concerns. It is easy to see which response will overcome the patient’s initial reluctance to set the appointment. Response 1 could lead down another whole path of conversations and arguments. Just as “but everyone else at school has one!” was not and will never be a successful argument from children convincing their parents to buy them some new gadget, this type of unsympathetic response will also get you nowhere. Don’t focus on the negative, or what you have no control over. Rather, discuss the benefits and reasons behind how your solution makes sense and is truly the answer to the patient’s needs. With Response 2, the call handler is acknowledging and agreeing with their objection, but overcomes the objection by demonstrating the value of why the patient should come to the office. It is difficult for patients to get mad or upset when you are agreeing with what they are saying. As the call handler, you need to help the caller get to their need—whether they are aware of that need or not. Subconsciously, patient wants you to point out things that they may not understand or have considered. CallSource has helped many hearing offices increase their front office staff’s performance in many important areas of the phone call – including overcoming objections to set the appointment. For more information on how to work on overcoming objections for appointment setting for your business, subscribe to our blog, or contact a CallSource representative today.